What I find most striking is, first of all, the continuity of the movement. While the government expected the pressure to ease, it has not. It is the fruit of an extraordinary determination, to which is added a surprising maturity. 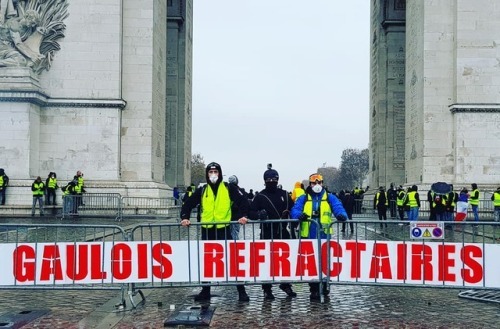 Not only do the Yellow Vests refuse to define themselves in terms of “Right” or “Left,” not only do they make up their minds without the least concern about what the parties and unions think, but they do not let themselves be caught in the journalists’ traps, for whom they have nothing but contempt. On television, they speak common sense, they do not dissemble, and they remain an example of firmness without appearing strident. Their anger and resolve show that, where most of them are now, they feel they have nothing left to lose. And in this they perfectly represent a France that, over the years, has realized that it can no longer live, and even now struggles to survive. Hence this movement of revolt, which first turned into a popular uprising, and then an insurrection. Breizh-info.com: The Yellow Vests have been widely criticized for using violence. Let’s say it first: the rioter-in-chief is Emmanuel Macron. It is he who broke the intermediate bodies, downgraded the middle classes, cut back social benefits, allowed the income of capital to rise at the expense of labor, increased taxes and the weight of spending cuts. He was installed to reform the country in order to subjugate the “refractory Gauls” to the requirements of the logic of capital and the dictates of liberalism. Those people who immediately adopted the slogan “Macron resign!” were not wrong. 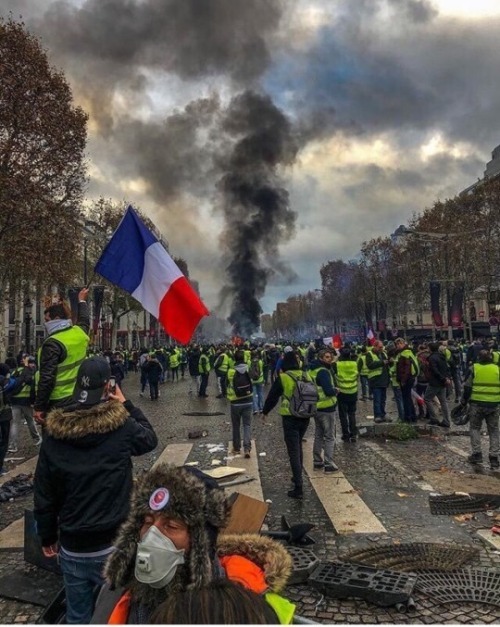 The violence recorded on December 1, including on the Champs-Élysées, was mainly the work of thugs and looters who were total strangers to the Yellow Vests movement. This was clear at the Place de l’Étoile, where the Yellow Vests protected the flame of the Unknown Soldier while singing the “Marseillaise,” while hooded individuals indulged in vandalism. While the police know the precise names and addresses of these thugs, they were deliberately allowed to intervene in the hope of discrediting the movement, but no one was fooled. If the violence decreased on December 8, it was simply because the police had carried out preventive arrests in these circles. That said, longtime reader of Georges Sorel that I am, I am not naïve about violence: it can be justified under certain circumstances, subject to a certain coherence. When power has become illegitimate, insurrection is not only a right, but a duty. It may be regretful, but no historical movement has ever escaped violence altogether. I am well aware that the storming of the Bastille, on July 14, 1789, which is today celebrated as the founding day of the Republic, was accompanied by some “excesses.” But above all, it must be noted that, without resort to force, the Yellow Vests would never have obtained anything. The “Demonstration for All,” a few years ago, gathered huge crowds that ended up leaving empty-handed. We do not make revolutions with well-mannered people! The government backed down this time because they got scared. This fear will one day turn into panic. Last Friday evening [December 7], we saw all the representatives of the ruling caste predict the apocalypse for the next day, and they pleaded for “calm” and “reason.” This is a classic strategy: after having demonized, condemned, defamed, and thrown gas on the fire, they try to disarm the challenge by inviting everyone to “gather around a table,” which is obviously the best way to go around in circles. It is sad in this respect that the “Right” opposition has not hesitated to sing the same tune: but it is true that that the bourgeois Right has long preferred injustice to disorder. Breizh-info.com: How do you explain the ubiquity of women in the Yellow Vest movement? Breizh-info.com: Would you say this is a historical event? Yes, without a doubt. The Yellow Vest uprising is radically different from anything we’ve seen in decades. The comparisons with February 6, 1934 are grotesque, and those with May ’68 even more so. Pasolini, in May 1968, scandalized his Leftist friends by declaring that he felt closer to the CRS [Compagnies Républicaines de Securité—i.e., the national riot police], who were at least proletarians, than the students, who were only petty bourgeois. Today, some members of the police have dared to fraternize with the Yellow Vests, because they are both from the same popular classes. At the end of the riots of May ’68, the real France marched on the Champs-Elysees to express their desire for a return to peace; today, if they march from the Etoile to the Concorde, it is to tell Macron to resign. The difference is in size. In fact, in order to find precedents for the Yellow Vests movement, we must return to the revolutions of 1830 and 1848, or to the Commune of 1871, to say nothing of the sans-culottes, the Book of Grievances, and the Estates General of France of 1789. What was initially a simple tax revolt soon turned into a social revolt, and then a general revolt against a system to which the people of France no longer want to listen. Is it the herald of a revolution? The conditions for that are probably not yet right. But it’s at least a dress rehearsal. For the time being, the people make use of their veto power. They have yet to realize that they also possess the power to create, and that what they aspire to achieve will only be realized when they have changed not only the regime, but also society. Then it will be time to talk about the Sixth Republic, if not the Second French Revolution. Breizh-info.com: And now, what will happen? Hard to say. Macron will not, of course, hand in his resignation. A referendum is more than unlikely (we have no clear idea of what would be decided); a dissolution of the National Assembly may open the way to a coalition; a change in the Prime Minister (François Bayrou?) is possible, but would probably not fix much. The government has, as usual, reacted both too late and too clumsily. But the result is there. The elites are paralyzed by fear, the commentators still do not understand what is happening, the Macronian reform program is definitely compromised, and Macron himself, who dreamed of being Jupiter sitting on Olympus, finds himself a tiny Narcissus flailing on his Tarpeian Rock, facing a people he says he hears, but to whom he does not listen. Whatever happens, the Yellow Vests have already won. They won because they managed to roll back the government, which the bourgeois families hostile to gay marriage, opponents of surrogate parenting, railway workers, unions, retirees, civil servants, nurses, and others all failed to do. They won because they managed to make visible what the establishment wanted to make invisible: the people who are the soul of this country. They have won by showing that they exist, that they enjoy the almost unanimous support of the population, and that they are determined to preserve their purchasing power, but also their own social standing. They won because by refusing to be humiliated and despised any longer; they have demonstrated their dignity. In the second round of the last presidential election, the alternative was supposedly “Macron or chaos.” People voted Macron, and as a bonus, they got chaos. This chaos is spreading everywhere, in France as elsewhere in Europe. At the mercy of a global financial crisis, the dominant ideology, which is responsible for this situation, now has its future behind it. The times to come will be terrible.